First, let’s be clear: You can’t overdose on CBD. Overdosing on CBD would be, I guess, you took a lot and feel really relaxed? The horror! But you also don’t want to be using an unnecessary amount, because good CBD is not cheap (If your CBD is what you would consider “cheap” it’s probably because it’s trash) So I am going to break down what I take, how much I take and when I take it. This has worked extremely well for myself and a good friend, as we both have come back from injuries that basically shelved us for almost a year. We are both now back to training and competing, pain-free. I use Pure Spectrum products because I know the hemp is grown right here in Colorado, at the largest USDA certified Organic Hemp farm in the United States. Getting that label from the USDA is not easy - and it covers everything from their growing practices, to how they harvest the plants and make the product. Pure Spectrum is big on their “Seed to Sale” transparency. In an industry where hustlers are always looking to increase their profit margins and are increasingly looking to places like China to import cheap, polluted, low quality CBD - I like knowing what I am putting in my body, is pure, organic hemp. They also post third-party lab tests of their product on their website. In the health and fitness industry or the supplement industry, that’s pretty rare. So to make things easy for you guys, I broke down exactly what I take, when I take it and how much I take. I also have a list of my favorite products below, ranked in order of importance, to me. I hope this helps answer some of your questions. Honestly, if you only buy one product and only use it once a day, this is what you should have on deck. Afternoon/Post-workout: Pure Spectrum 1250. I refill old THC cartridges for my vape pen with the Pure Spectrum tincture. Lifehack. You’re welcome. Evening: Pure Spectrum face and hand lotion. If it was a hard training day or I can just feel some soreness coming on, I’ll use the pain salve or muscle lotion topically as needed but I use the face and hand lotion every day. CrossFit Games athletes Brooke Ence and Logan Ewing (Center and Left) with Mile High CrossFit owner Bekka McCoy. Scoop the 99% isolate powder on to the end of a popsicle stick. Use enough to cover the entire curved end. Put the powder under your tongue, hold it there. While holding it under the tongue, take a full dropper of the 1250 tincture and squeeze it under your tongue as well. Hold both there for at least 60 seconds if possible. Enjoy - this has also been referred to as “The Hangover Dose” - so if you want, use it after hard training or hard drinking apparently. I put these in order of importance to me personally. If I could only have one product it would be the 1250, if I could only have two, the 1250 and the powder, etc. Pure Spectrum boasts an 80%+ customer retention rate, which is unheard of in most industries. This is because their products work. I have spoken with numerous people who told me they tried CBD a while back and did not notice any benefits. I always encourage them to give it one more chance and to use a reputable company like Pure Spectrum. Nearly all of them contact me a month later and can’t believe the difference. They were using ground beef and saying they didn’t like red meat - I got them to try some filet mignon, and their view changed. 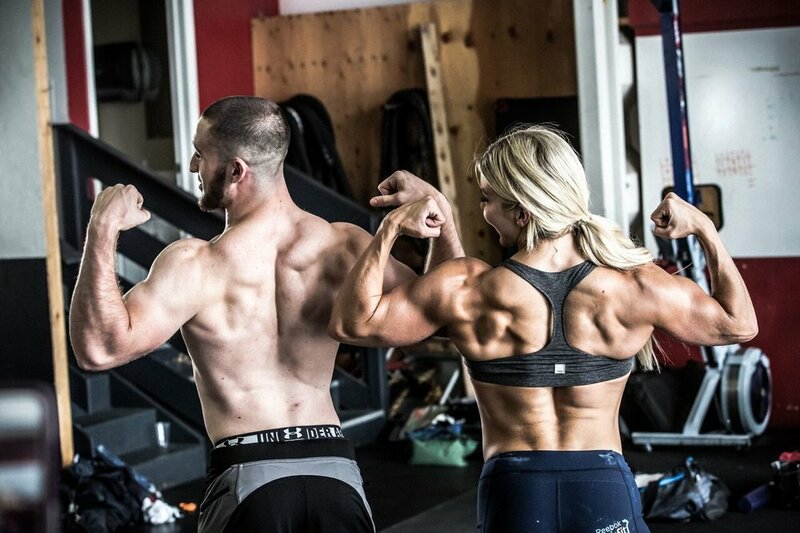 CrossFit Games athletes Logan Ewing and Brooke Ence flex-off during the Pure Spectrum CBD commercial shoot at MBS CrossFit. Both Games competitors trust Pure Spectrum for their recovery needs. Follow any of the links in this story to check out Pure Spectrum’s full product line. Find out why Games athletes like Brooke Ence, Emily Bridgers, Dani Horan, Logan Ewing and many, many more, let Pure Spectrum be their advantage. wild/STRONG readers get 10% any order, just use the code: WILDSTRONG at checkout.